In a month my lovely taster will be off to Japan for a year, and to help prepare we wanted to learn how to cook Japanese food. Until this point my vague idea of Japanese food was crisp tempura, amazing fresh seafood, and carefully prepared sushi. Delicious, but not really feasible for simple weeknight meals. So what do Japanese people eat at home? As always eGullet had not just the answers but recipes and a bunch of enticing pictures. And so we decided to make oyako donburi. With the confidence of a man who didn't just learn about what donburi is on wikipedia, let me teach you about this Japanese staple. 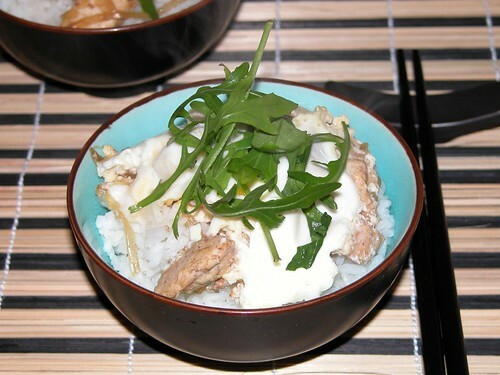 Donburi refers to a style of Japanese one-bowl meal where a topping is served over rice in a large rice-bowl that itself is known as a donburi. Oyako-don is tasty, quick, and easy to make even without the traditional oyako nabe. The oyako nabe is a special pan with shallow sides, a vertical handle, and a lid that sits right on top of the food. I made do with a large saucepan and the smaller lid of a different pan, and although I felt deep shame for offending Japanese tradition, the food was great. 1. First make up the sauce. Combine the dashi, mirin, and soy in a medium-sized saucepan and bring to a simmer. Taste the sauce and adjust the dashi, mirin, and soy to taste. 2. When the sauce is simmering, add the sliced onion and simmer covered until tender. If it's drying out add a little more water. Add the chicken and simmer until just cooked through. 4. Very briefly whisk the eggs together — they should still look barely combined. Pour the egg mixture over the chicken and sauce, and place a smaller saucepan lid directly over the eggs to create a tiny little heat chamber to quickly cook the eggs for 1-2 minutes. The egg whites should be just set, with the yolks still runny. 5. Serve over hot rice and scatter with mitsuba. 1. Mitsuba is also known as Cyptotaenia or Japanese Parsley, and has a fresh and slightly peppery taste. I was going to substitute watercress, but since mine wasn't looking so good I had to use rocket (arugula) instead — as much as the greenery helps the presentation, next time I'd leave the rocket out if that was all I had.